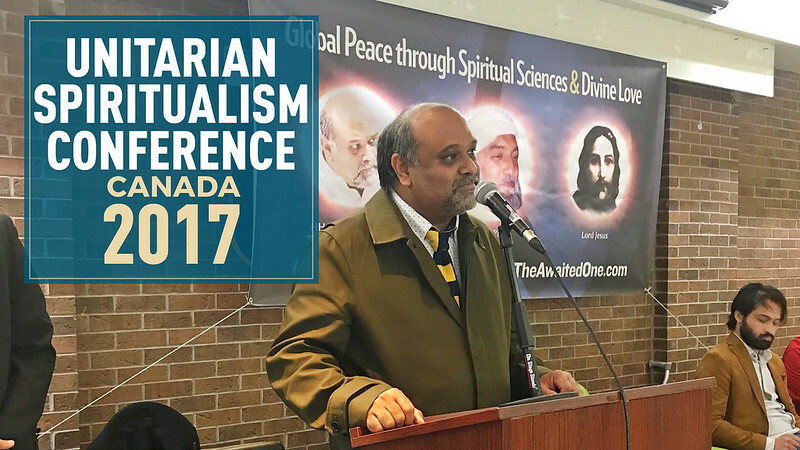 The following is the transcript of Younus AlGohar’s speech delivered at the Global Peace Through Spiritual Sciences & Divine Love programme in Toronto, Canada. Good afternoon. I am privileged, honoured and very happy to be here in front of you. I would like to share some of my thoughts, some of my feelings and some of my experiences. I’m not going to give you a lecture on spirituality, but I would like to raise awareness of open-mindedness, of human values and love. A few hours ago, I was checking my Facebook and there was a video of a young man who was brutally getting beaten up. People were pelting stones at him. They were throwing at him anything they could grab. Then, he died and they stripped him naked. He was all naked and soaked in blood, but the people who were beating him up didn’t stop even though they realised he was dead. They were throwing huge stones at his dead body. His skull was cracked open and there was a fountain of blood coming out from his head. They were raising slogans, ‘Allahu Akbar, God is great.’ There were more than 100 people. They were killing this one, solitary guy with the help of these slogans. Is this religion? This is terrible. How would you feel if this was happening to you? These people, they were not Taliban or ISIS. They were not terrorists; they were common folks. This is the level of fanaticism, extremism and ignorance. We are living in the 21st century, where science has provided us with a lot of inventions and has made life a little easier than we could have imagined 50 years ago. However, we’re going downwards emotionally, spiritually, intellectually and, of course, mentally. We believe Christianity, Islam and Judaism were all founded by individuals who were sent by God, but people of one religion have a very fierce disagreement with others; although all these religions were founded on principles of divinity. It is strange. This is not one solitary incident. Wherever you go, you will see these incidents taking place. It is a very sensitive matter that I am speaking on, however, I cannot keep quiet. I cannot just go here and there and deliver lectures on spirituality, and not even realise what people are going through. We’re living in very strange times. It is like I want to go to England and I bought a ticket with Air Canada. Now, [suppose] I change my mind and I don’t want to fly with Air Canada – instead, I want to fly with British Airways. If Air Canada says, ‘No. If you don’t fly by Air Canada, we will kill you,’ this is ridiculous. My main destination is England. Air Canada, British Airways, Virgin Atlantic and all other airlines are just means of travel. In a similar way, God is the destination and the religions were supposed to be the means of travel. If I lived as a Muslim for ten years and now I want to change my religion and become a Christian, and you tell me, ‘If you leave Islam, we will kill you,’ it doesn’t make any sense to me. Why? Jesus was also sent by God. What is wrong with Jesus? What is wrong with Christianity? Joseph, Jacob, Moses, Adam, Abraham – all these spiritual dignitaries were sent by God. Why should I become a religious person and risk my life, my peace and the lives of my family? [When I know that] if I didn’t like this religion after ten years and I wanted to switch over – maybe I liked Judaism and wanted to become a Jew – people from my previous religion would want to kill me? It is not making any sense to me. The thing is, when all these three Abrahamic religions were founded by divinely sent individuals, I do not understand why we have difficulty to accept all the religion and respect them all? Now, there is something wrong. All these religions were founded to cater for the needs of the people of one particular area. They were not designed to cater for the needs of everybody. While I am speaking, I would like to take this opportunity to have my say on this point: there should be no such thing as Islamophobia. The threat is not coming from the religion of Islam, the threat is coming from the majority of people who misunderstood Islam. When you become a fanatic, your gates are shut. There is no such thing as extremism. For example, blessings. Whether the blessings are just little in quantity or huge, they will never change from blessings into something else. In a similar way, God’s love or religious values, even if you take them for extreme, they will not hurt or harm you. So this is not extremism; this is fanaticism. This is hatred and ignorance. One who doesn’t value a human life, I can never accept that person can ever love God. One who cannot appreciate human values – the value of a human life – I do not think he follows any religion at all. What comes from the divine, nobody will go against it: that is love. Ask anybody, ‘Do you like love?’ Maybe they will say, ‘We love love,’ whether they are Muslims, Christians, Hindus, Sikhs or Jews; even those who don’t practise any religion. Love is divine. What we need today in this global society is love. The thing is, where is love? It is not available at Macy’s, Walmart, churches, mosques, synagogues or temples. Love is not [as easy to get as going] to Tim Hortons for a cup of coffee and Timbits. Love is hard to come by. Love is a passage that is paved with a lot of self-denial and sacrifices. So is it just a phrase or is it a reality? It is a reality. When you want to love your enemies, it simply means you have nothing left in you but blessings and love. It is when you have no other feeling left in you; when you have subtracted all other ailments of being a human being and negativity from your personality. Nothing is left but love, blessings and the divine bounty in you, so you are forced by your nature to love everybody. What I am saying is not imperative. It is not advice. I am sharing my thoughts. Honestly speaking, my concern these days is to raise awareness of this ignorance which is prevailing in our societies: hatred in the guise of distorted religions. It is really troublesome and it is spreading like fire. If we just keep ourselves busy with spiritual practices at home, in the workplace or meditation centre and we do not take it upon ourselves to correct society and the mentality of people – the way people think – then we are not going to have a wonderful society. This hatred is prevailing. We need a lot of hearts which have been kindled with the flame of love. Lectures upon spirituality will not help anybody. We need some practical exuberance of love. We need to have a spiritual trade in which we import and export love. Love is a substance. Love is not just [limited to] talk. The place of love is the heart and the heart must be free. If the heart is already preoccupied with a lot of other activities, the heart is not going to practise love. You can only preoccupy your heart with one activity because love is a very heavy duty activity. We need to free our hearts from all shackles. Then, get our heart admitted in the kindergarten of love. When the heart has learned to love, you will become a wonderful person. Then, you are love for everybody; you are love to everybody. This love doesn’t come by reading books, going to temples, churches or listening to lectures. We have to teach our hearts. We have to provide our hearts with positive energy. That is the first thing. There are many different sources of positive energy. For example, names of God – any name in any language. It may seem confusing: how can positive energy be obtained from names of God? But there is a way, a method according to which the name of God is said in a certain way, for a certain number of times, then it starts to generate divine energy. The moment it starts to generate divine energy, you feel the vibration. That vibration will nurture the innermost nature of your heart. When your heart has learned to love you will feel the vibration. Q: What in a human being [makes them] distance themselves from the actual state of being loving and feeling divine love? There are multicellular and unicellular living objects. In a similar way, we are multi-spiritual. It is a huge universe and we have seven spirits in our body. The spirit which can be in the most possible nearness of God is the main spirit. Some people who want to be near to God – but they do not know that the soul which can drag them into the most possible nearness of God is still not enlightened, they feel the distance. They are in the presence of God, however when it comes to measuring the distance or nearness, that particular spirit which can go into the most possible nearness of God is the main spirit (the soul). When it is enlightened, you will have difficulty in finding out whether it is [you] or god; you become so near. Q: How could we raise the vibration of love in the world? To bring more love? That is a very difficult question. Before I give away money to everybody, I need to make sure my pockets are full. First, we need to make sure that we have enough love. There is a difference in a talkative form of love and practical love. Practical love resides in the heart, it lights up like a candle. The rays of love cannot be controlled. You will just sit there and the beams of love will emanate from your heart. You become so intermingled with the substance of love that you become love on two legs. Love has no boundaries; it is for everybody. For example, you love human beings but not your dog? [Then it means] you are a liar. You love a human being but you don’t care for the cat on the street? Then you are a liar. Love is blind and it is for everybody; whether you are two-legged or four-legged, does it really make a difference? When there is only love, this is for every single form of life. Some people only love human beings or their pets. They say, ‘This is my pet, but I don’t love [someone else’s] pet.’ When you have pure love in your heart, this will not happen. You will love all animals like your own pet because you have love [in your heart]. Something is missing in love when love is exclusive. Love is perfect when it is inclusive. This is my understanding and this is how I view love. Maybe some other people view it from another angle and have discovered more about love – but this is my discovery about love.